Thomas Rainsborough (1610�1648) was a prominent figure in the English Civil War, and most famous for being a leading spokesman for the Levellers in the Putney Debates. After serving as a captain in the Royal Navy, Rainsborough started the Civil War as a Roundhead. But by May 1645, he had become a Colonel in the New Model Army, taking an active part in the battles at Naseby and at Bristol. Later that year, he captured the symbolic stronghold of Berkeley Castle and in 1646, he helped conclude the Siege of Worcester. He then became an MP (Droitwich, Worcestershire). In October 1648, Rainsborough was sent by his commander, Sir Thomas Fairfax, to the siege at Pontefract Castle. En route he stopped in Doncaster, and was murdered by four Royalists during a bungled kidnap attempt. The site is still marked today by a plaque outside of the House of Fraser. His funeral in Wapping, London saw thousands of Leveller-sympathising mourners wearing the Levellers' ribbons of sea-green and bunches of rosemary for remembrance in their hats. 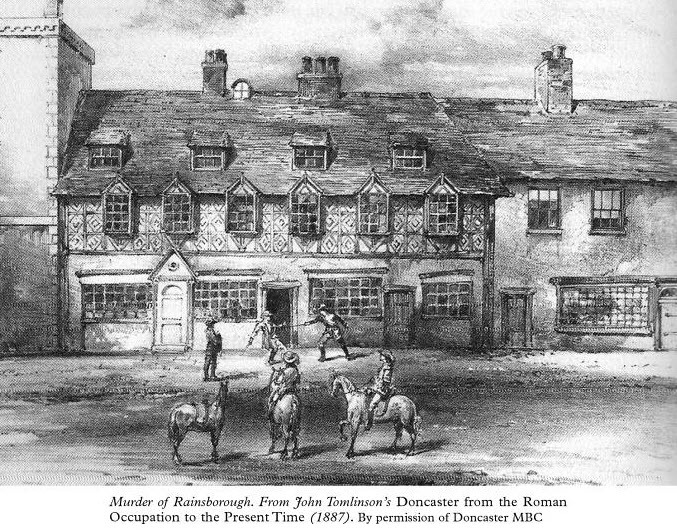 There have been calls to commemorate Rainsborough at an annual �Rainsborough Day� in Doncaster Market Place and to erect a plaque at the place where he was killed.